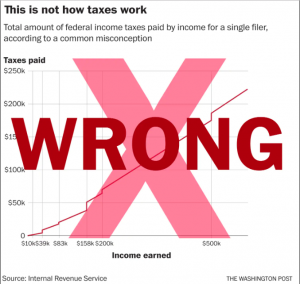 About half of all Americans fundamentally misunderstand how U.S. “tax brackets” work. (Ironically, those in the traditionally “fiscally conservative” party are significantly more likely to fundamental misunderstand our tax system.) As a result, many, many, many Americans argue and vote against both public interest and their own interest, with the sole beneficiaries being the extremely rich (both human and corporate). Now’s the time to get your head straight. 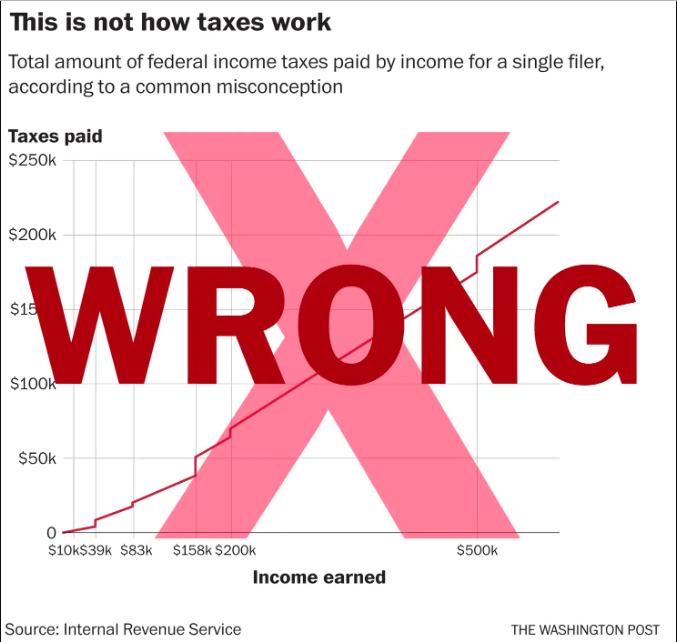 The Twitter thread embedded below lays it out nicely, as does this article from the Washington Post (which takes just three minutes to read, and even explains why we use this somewhat counter-intuitive and often confusing tax bracket scheme). Not for nothing, but I’m not a huge fan of Black Friday/Small-biz Saturday/Cyber Monday/Giving Tuesday/etc. Yeah, there’s power in focusing our economic force on these specific days (obviously)—but also, there’s power in you just spending money on what you want when you want it. Anyway, I love the denim from these cats in California, Brave Star. The cuts work for my particular body, the construction is quality, and the materials a delight (more of my thoughts on Brave Star—who, incidentally, are still using some of the final bolts of historic Cone Mills denim I mention in the post at that link). Rebel Nell works with local organizations to hire women transitioning from homelessness and teaches them to craft unique, wearable accessories made from the fallen layers of graffiti that grace the buildings and underpasses of Detroit. DISCLOSURE: I’m from the Detroit Metro Area. My dad was born and raised in Detroit. We love that stupid city, my family has planted their hearts there, and I’ve bought Rebel Nell jewelry for my wife. It’s neat stuff! But Rebel Nell isn’t just mining the lead-flecked ruins of Detroit to sell bougie baubles. 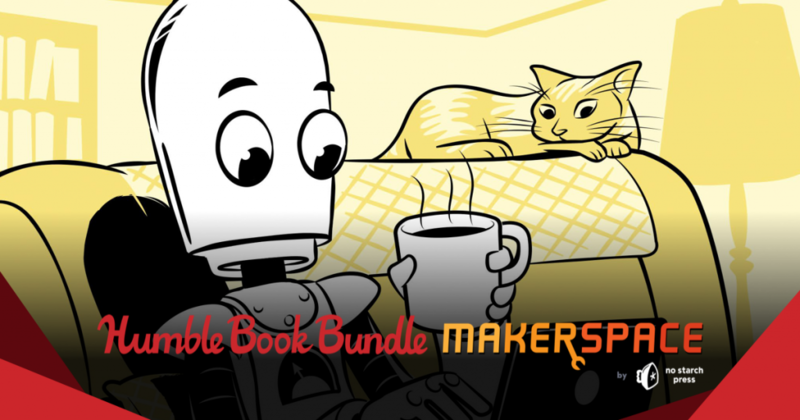 Through their non-profit arm—Teaching. Empowering. Achieving. (T.E.A. )—Rebel Nell provides all the wrap-around services to empower vulnerable women and families as they transition to a life of independence. T.E.A. invests in training, education, skills development, coaching, and mentorship services (including basic employment opportunities), in addition to other support and assistance to these women. This ain’t giving away fish; it’s teaching folks how to fish, and making sure they’ve got a decent rod and reel to get them started. This is Azzie. She’s Rebel Nell’s production manager and an alum of their programs. The Nelson Foundation provides financial support to individuals and organizations that use art to create opportunities that better our community. (Note conspicuous name similarity—this is something my folks and older sister make happen.) These usually take the form of direct grants and tuition support to underrepresented students in the arts in Michigan. 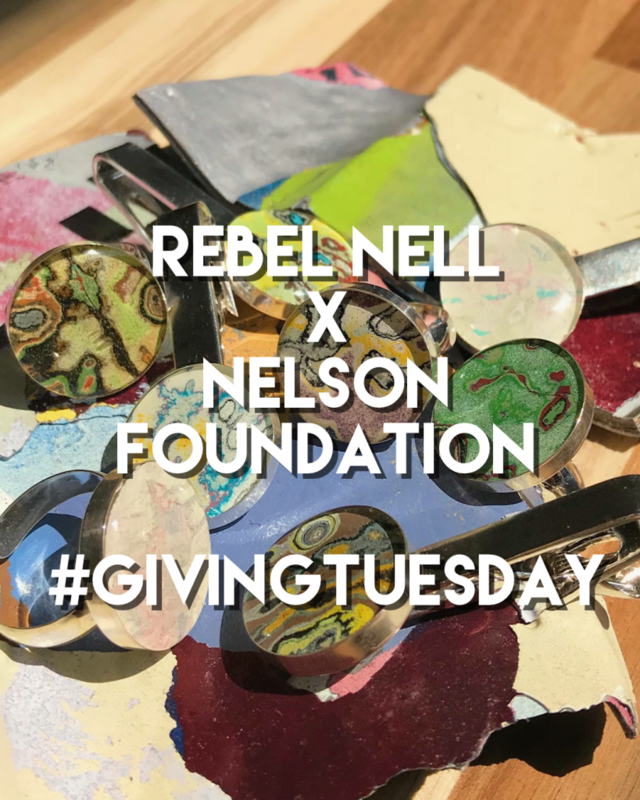 This Tuesday—November 27, 2018—The Nelson Foundation will be giving up to $5,000 to Rebel Nell/T.E.A. in matching funds. You give $1, and the Nelson Foundation matches that. 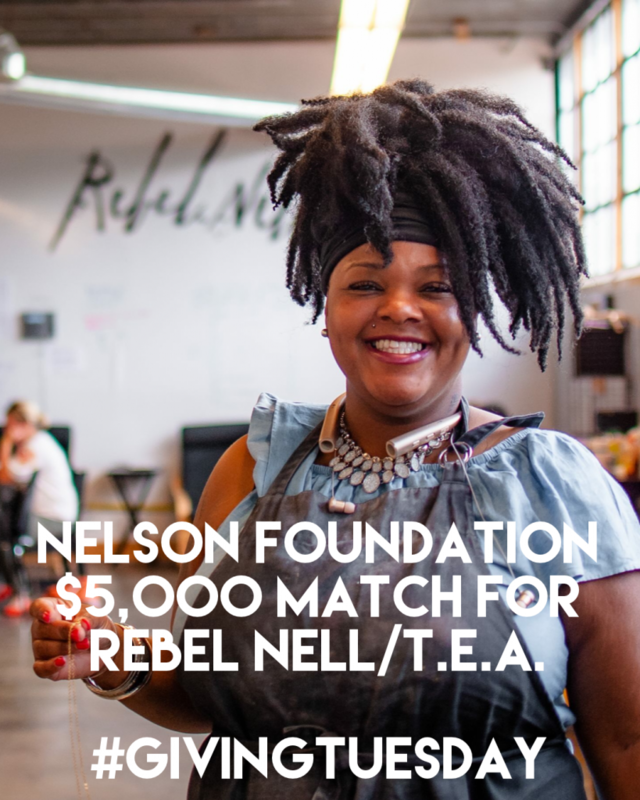 Everyone together gives $5,000 and the Nelson Foundation doubles that—boom!, $10,000 goes directly to supporting women and families getting free and building up their communities. 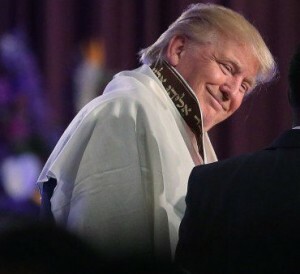 Click to give! Pay it forward. Spread the word. Anyway, he’s unfit to serve, both because he’s actively averse to the mission of the agency he’s heading and because he encourages corruption. Here’s what I wrote to my reps; maybe you wanna contact yours today. Not shockingly, those lobbying for payday lenders donated roughy $63,000 to his various campaigns. Earlier this year, in his role as interim head of the Consumer Financial Protection Bureau, Mulvaney dropped probes and enforcement actions focused on payday and high-interest lenders. Given current reporting and his own statements and conflicts of interest, Mick Mulvaney seems generically unfit to head the White House Office of Management and Budget, and nauseatingly unfit to serve as the interim head of the Consumer Financial Protection Bureau—let alone White House Chief of Staff (his rumored next role). For that matter, I’m not particularly comfortable seeing a man who so clearly accepts corruption as a “cost of doing business” return to the Legislature—but that’s for the people of South Carolina to sort out, may God have mercy on their souls. 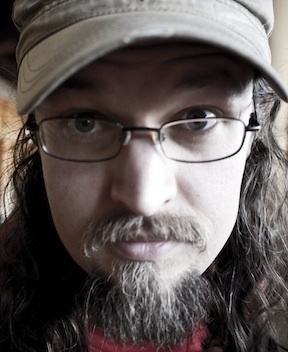 Thank you again for your time and for continuing to fight the Good Fight in D.C.
David Erik Nelson . . .
Short version: Most office workers in the United States have a nearly 9-hour workday, but are only productive for about 3 hours. I.e., if you are a freelancer doing work that an office worker might do, then you can almost certainly make a decent living on ~3 hours per day. Please stop beating yourself up and running yourself ragged. Focus on doing good work for half of each day and you’ll be just fine. You know when your cousin–or whoever–archly intimates that Those People don’t really need food assistance or tuition assistance or healthcare subsidies or whatever, because “You always see Them with nice clothes or a new iPhone or a big flatscreen TV!” or whatever? Remember this chart. And then show him this chart. Similarly, when he points out that folks used to be able to work a summer in a factory and pay for a full year of college, back before affirmative action and illegal immigrants took all the decent jobs from hard-workers and gave them to the under-qualified and under-productive–please, once more, remember this chart. And then show him this chart. Poor people have nice TVs because wages have gone up a little and the price of TVs has dropped like a brick. Cousin Bigoty can’t afford to get his kids an education because wages have gone up a little and tuition has shot the moon. That said, economically speaking this chart is by no means a slam dunk for any particular political worldview. 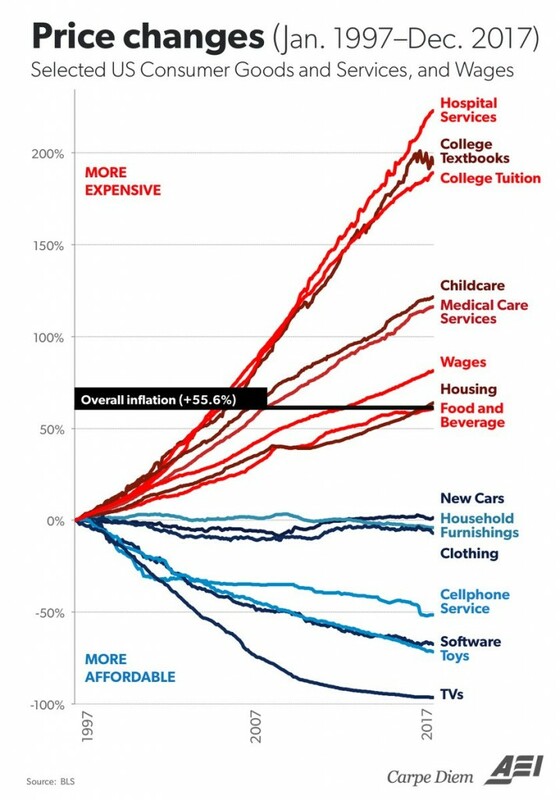 Check this article, with its nearly 180-degree interpretations of this chart: The same data can be read as either an indictment of failed socialism being inevitably co-opted and driving up the cost of necessities, or as an indictment of late capitalism giving the masses their “bread and circus” while denying them the necessities of serviceable healthcare, housing, and education. For my part, it looks to me like what happens when you have massive (and growing) income disparity: Everything divides into either run-away Veblen goods or near-disposable commodities (from the perspective of those at the nose-bleed heights of the top of the hockey stick). This chart illustrates why, for many Americans, America no longer feels great, and similarly why all the trade protectionism and corporate tax giveaways and draconian immigration restrictions in the world will never make America great again. Long story short: Mulvaney the current head of the Office of Management and Budget, and last week the President also made him acting director of the Consumer Financial Protection Bureau (CFPB). This is a little odd, since Mulvaney is on the record calling the agency a “joke” that he’d eliminate—but that’s all just talk. What’s fundamentally rotten is that Mulvaney received roughly half a million dollars in donations from financial organizations that have been fined muy mucho dinero by the CFPB. I’m not casting aspersions on Mulvaney or claiming he’s done—or would do—anything wrong; I’m sure he’s a great guy, and plausibly has many good ideas that make him highly qualified to filly two essential 120-hour/week gov’t positions. But just as a thought experiment, say you had a kid in day care, and that day care hired someone who seemed like a fine pick and totally passed the criminal background check, but had also accepted millions of dollars from a group of notorious and powerful pedophiles. Would this cause you concern? Anyway, please take a minute and call your reps, and explain that you think there is maybe a moral hazard here. This is an easy one: the budget currently under consideration cuts the Environmental Protection Agency’a funding by ~30%. Right now the EPA has one (1!) toxicologist serving the six-state region that includes Michigan (where we just had an enormous lead-tainted-public-drinking-water problem). That’s down from four toxicologists a few years back—and even with 4x the staff they were overburdened. It simply isn’t possible to assure safe air and water with the EPA running at two-thirds power—and if we want to increase domestic manufacturing, then we’re going to need to be even more diligent than we are today. Call yr reps and urge them to push for full funding of the EPA.